Everyone in a nursing care setting should be aware of the chemicals used at the facility, how to use them, how to protect themselves and residents, as well as, emergency procedures if someone is exposed. 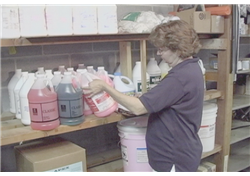 Â This video explains the difference between physical hazards and health hazards, and introduces MSDS (Material Safety Data Sheets) documentation that explains the proper handling, labeling, and storage of chemicals. Also stresses the importance of staff awareness of eyewash locations, knowledge of personal protective equipment, and properly introducing new or trial chemicals into the facility. Includes manual with post test.